Thank you for coming today, everyone. I want to convey fully to the people of the world how Kirby’s Epic Yarn was made, so I invited the developers to gather here today. During the first half of this session of “Iwata Asks,” I will be speaking with developers from Good-Feel1 and Nintendo, and during the second half I’ll move on to the developers from HAL Laboratory.2 Could everyone from Good-Feel please introduce themselves? 1Good-Feel Co., Ltd.: A software developer whose key concept in development is making some things that “feel good.” Good-Feel’s main office is in Kobe, while their development activities are based in Tokyo. 2HAL Laboratory, Inc.: A software developer that has worked on the Kirby and Smash Bros. series, among others. 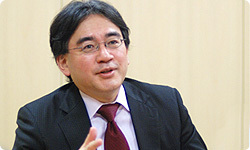 Nintendo president and CEO Satoru Iwata worked as president for HAL Laboratory. In 2010, HAL Laboratory celebrates the thirtieth year since its founding. I’m Ebisu from Good-Feel. As one of the producers of this game, I was in charge of management and administration at Good-Feel. I could say I also did a lot of random chores, but this time I went beyond that and did a number of things as a member of the staff actually making the game. You were a producer, but you also immersed yourself in actually making the game. Yes. I was fully immersed in it. Everyone’s making a lot of doing random chores. (laughs) That’s a good thing. Yes. (laughs) I did a lot in a variety of different areas. I’m Kono from Good-Feel. I was chief planner during the planning phase, but early after the project had begun, I was in charge of designing the game world as chief designer. For the most part, this was my first time to be so broadly involved in game development, so this title came to mean a lot for me. In addition to design, you were also involved in planning. Yes. Until now, I’ve worked as a designer on aspects of video games that are visible to the eye, but this time I was thinking from start to finish about how I could make the game fun through the various mechanisms in it. And now would the two of you from Nintendo also introduce yourselves? 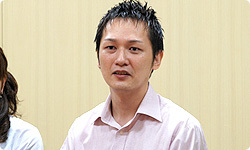 I’m Matsumiya from the Software Planning & Development Department. I, too, was a producer. This is the second game, after Tales in a Box 3, that I have produced together with Good-Feel. This time, I offered my opinions over a wide variety of subjects, from broad areas like the general direction the product should take to adjusting the finer details of the levels - like raising platforms a little higher and so on. 3Tales in a Box: Hidden shapes in perspective! is a puzzle-adventure game released as Nintendo DSiWare in June 2010 for 500 Nintendo DSi Points. Players turn their head or Nintendo DSi system to peer into 3D images on the screens in order to find hidden items or words. For more information about Tales in a Box, click here. You have experience working in the Software Quality Control Department, the predecessor of the Mario Club4, and you’ve always been good at playing video games, so you’re a producer with a solid perspective when it comes to adjusting difficulty levels and designing maps. 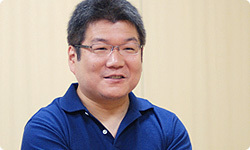 4Mario Club Co., Ltd. is responsible for the debugging and test play of Nintendo software during its development. Yeah. (laughs) In the past, I’ve been involved in activities like adjusting the maps for action games. You were in charge of taking the place of beginning players and voicing your undefined feelings. (laughs) That’s important for a Kirby game. Yeah. (laughs) Even if I just had a vague feeling, I tried to tell them what it was. Did you perform random chores, too? I did, of course, do random chores too. I like the way everyone on the team is bragging about doing random chores. (laughs) People tend to treat such tasks as something that you don’t do unless you have to, but a team that has lots of members willing to perform such odd jobs will run smoothly. I think that may have something to do with how attractive this game has turned out to be. Ebisu-san, could you tell us a little bit about Good-Feel? Sure. Good-Feel was established in 2005, so it’s been around for about five years. It was formed by people who had built up experience in the gaming industry and wanted to make a go of it on their own. Kirby’s Epic Yarn is our third game developed together with Nintendo, following Wario Land: The Shake Dimension 5 and Tales in a Box. 5Wario Land: The Shake Dimension: An action game released for the Wii console in September 2008. How many people do you have in the company? We’ve gradually increased in number. Right now we have a little less than 70 people. What are you guys good at? Good-Feel was formed by people who had worked on action games, so we’re good at action games, but we’ve built up experience in a variety of genres, and we want to keep working in new areas. So this time, we wanted to do something new and developed the game with an attitude of starting from scratch. I see. 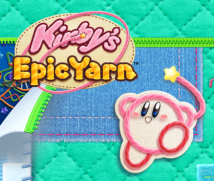 By the way, Kirby’s Epic Yarn wasn’t originally intended to be a Kirby game. You really did start from scratch and for a while were making a completely new title called Fluff’s Epic Yarn. Fluff, the main character at that time, shows up in Kirby’s Epic Yarn, too. A “world of yarn” has been the setting for this game from the very start. How did you come up with the idea of a world of yarn? 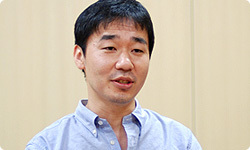 The person who came up with the original idea was Madoka Yamauchi, director of Wario Land: The Shake Dimension. He’s Planning Section Manager of Good-Feel, and one day he came to me with that idea. When I asked him how he came up with it, he said it just sort of came to him. Right then and there, I thought it was a good idea and decided to come up with the proposal for a video game incorporating specifications unique to yarn and a game world with certain warmth to it. Kono-san, you did the visuals for the proposal, didn’t you? Yes. I worked on them together with Tsukawaki, head of our design department. The images in a proposal don’t move, so we bought a bunch of cloth and took pictures of it to use. We actually used yarn and literally sat there trying different things out and tossing around ideas. Craft materials were spread all across the desk. It didn’t look like we were working on a video game at all. Sei-san, you saw that, didn’t you? Right. Then after making the proposal, we presented it to Nintendo. Matsumiya-san, you were there that day. What did you think when you first saw it? I was pretty shocked right from the very first page. 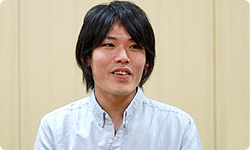 You could say that Kono-san’s visuals inspired everyone to take up the project. After the project was officially approved, did you make a prototype? Yeah. That far and no further.